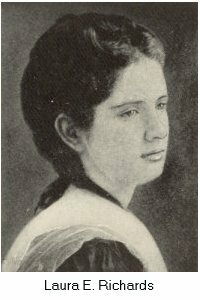 Laura Elizabeth Richards was born February 27, 1850, at 74 Mount Vernon Street, Boston, Massachusetts, to distinguished parents and a home life that would early introduce her to the delights of language and fine arts as well as to a range of people and experiences. Her father, Samuel Gridley Howe, "a restless social reformer . . . [who] later gain[ed] fame as an abolitionist,"  was also "the practical founder ... of the Perkins Institution and Massachusetts School for the Blind" in 1832. Howe's star pupil -- and Laura's namesake -- was Laura Bridgman, a child who had been left blind and deaf after a bout with scarlet fever at age two. When Bridgman was seven, Howe met her and brought her to Perkins, where she became the first blind and deaf person to learn language and "finger spell." (Another Perkins student, Anne Sullivan, later taught Helen Keller.) Richards's mother, the poet Julia Ward Howe, is perhaps best known as the author of "Battle Hymn of the Republic." Laura was the youngest of four children: Julia, Florence (named for her godmother, Florence Nightingale), and Henry. A fifth child, Maud, was born a few years later, and a sixth, Sam, (who died of diptheria at age three), several years after. The family moved to various homes in and around Boston during Richards's childhood. 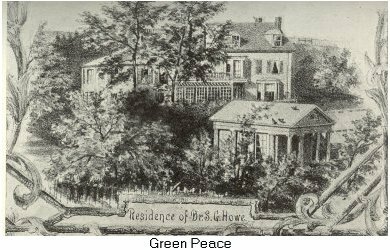 Among them were Green Peace, a house on five acres of land, and the Perkins Institution, where Howe, as Director, had one wing for the family's use. When we [children] gathered delightedly round the piano . . . we soon began to sing with [mother]. German songs, many of them brought back from Heidelberg by Uncle Sam Ward . . . sparkling French songs whose gayety was enchanting . . . Italian songs that flowed like water under moonlight; to say nothing of English and Scottish ballads without end. At seventeen, Richards accompanied her parents and sister Julia to Europe, visiting London, Rome, Venice, Athens, and Antwerp. In the winter of 1869, she became engaged to Henry Richards, by then a Harvard classmate of her brother's. They were married on June 17, 1871, the year he graduated from Harvard. The pair honeymooned in Europe because "[a]n architect, it was then thought, must know something of European architecture" (130), first stopping in England to see Richards' family, then travelling to Bruges, Ghent, Antwerp, Nuremberg, Innsbruck, Venice, Naples, Florence, Rome, Athens, Constantinople, and Milan. A number of those early rhymes, with illustrations by John Ames Mitchell, were then published in St. Nicholas. During an economic downturn in the 1870s, her husband's business floundered. Henry's brother, Frank Richards, offered him a management position in the Richards's family's paper mill, and, in the summer of 1876, Laura and Henry Richards and their three children moved to Gardiner, Maine. They lived with various members of Henry's family for a time, then found "a square 'Colonial' house, with ell and barn, large chimneys, an open fireplace in every room, and even more important, an acre of lawn and garden" (251). Here, in the Yellow House (apparently so-named because the Richards soon replaced the brown exterior with yellow, a "warm, friendly pumpkin-color" ), four additional children were born: Henry, Julia Ward, Maud (who died circa 1885), and Laura Elizabeth II. Richards's first book, Five Little Mice in a Mouse Trap was published in 1880, as was The Little Tyrant; two additional titles, Our Baby's Favorite and Sketches and Scraps (the latter illustrated by her husband), appeared the following year. The same decade saw additional publications, including retellings of folktales such as Beauty and the Beast and Hop o' My Thumb (both 1886), and both volumes about Toto (The Joyous Story of Toto  and Toto's Merry Winter ). 1889 produced Queen Hildegarde, which Richards described as "my first stumbling essay in books for girls" (369). This became the first of her Hildegarde series (about which she observed [circa 1930], "the later [volumes] are better written than the earlier ones; if I were twenty years younger I would write Queen Hildegarde over again" ). I doubt if Mrs. Richards realized how widely these books were read and how generally loved. A paragraph from any of them, or even mention of the titles, brings to memory a picture of five girls thirty-odd years ago . . . relaxed in the late afternoon sunshine. . . In front of them are the wooded San Juan Islands . . . But their minds are on other scenes: a secret room under a stairway where a girl of another generation had put away her dolls; a young girl dancing in the moonlight or rescuing a selfish woman's jewels from a fire; a glamorous Cuban girl's romance and adventures during the Spanish-American War; the arrival in their new home of the ingratiating Merryweather family . . . While Richards was turning out books, her husband's family was strugging with the paper mill and the effects of technological change. As she explained, "By 1884 it became evident that if the Richards Paper Company were to live, its nature and its habitat must be changed. A pulp mill was built on the Kennebec at South Gardiner . . . and here the new industry -- new in this country; our mill being the first to introduce it -- was vigorously carried on. Sulphite pulp took the place of rags; instead of the long, echoing sheds, and the vats and 'rolls,' came 'digesters,' huge iron containers in which the spruce logs, carefully selected, were 'cooked' to pulp" (296). Disaster struck in 1893, when "on a winter's night, the pulp mill burned to the ground" (297). Although it was rebuilt, "the paper-making world [was] changing . . . like the shifts of a kaleidoscope, the great combination companies relentlessly strangling the small ones" (298), until, in 1900, the mill finally closed. After some thought, the Richards family considered opening a small private school. Asked his advice, their friend, Reverend Endicott Peabody of Groton School, instead suggested a camp for boys. Henry remembered "a spot that greatly took his fancy; a strip of forest bordering on Belgrade Great Pond" (301), which the owner was persuaded to sell. 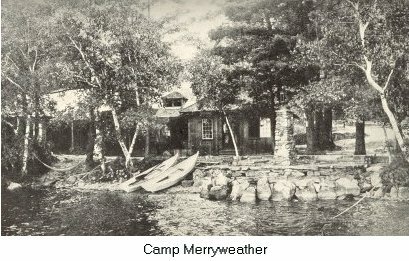 Camp Merryweather (so named because in the Hildegarde and Margaret books, the Merryweather family spent their summers "at a Camp somewhat resembling [the one] at Cobbossee" ) opened 30 June 1900, and was still in operation 30 years later when Richards wrote her autobiography. In the twentieth century, Richards continued to write children's stories and verse, including the two-volume Honor Bright series (Honor Bright: A Story for Girls  and Honor Bright's New Adventure ), and an unsuccessful sequel to Captain January (Star Bright ). Her best-known collection of verse was Tirra Lirra: New Rhymes and Old from 1932 (reissued in 1955 with a preface by May Hill Arbuthot), which incorporated early verses, many of which had been published in children's magazines, along with new material. 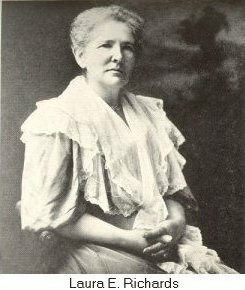 During this period, Richards also wrote biographies, some of family members or friends, including Florence Nightingale: Angel of the Crimea (1909), Two Noble Lives: Samuel Gridley Howe and Julia Ward Howe (1911), and Laura Bridgman: The Story of an Opened Door (1928). Richards and her sister Maud Howe Elliott co-authored Julia Ward Howe, 1819-1910 (1915), for which they received the Pulitzer Prize for biography in 1917. Her final book, What Shall the Children Read, was published in 1939; the following year, the Gardiner Public Library Association issued Laura E. Richards and Gardiner, a compilation of Richards' poems and articles which had been previously published in local newspapers. Richards died on 14 January 1943. Laura E. Richards, Stepping Westward (New York: D. Appleton and Company, 1932), 1. It shoud be noted that the webpage for The Perkins School for the Blind (formerly the Perkins Institution) cites 1929 as its founding date. Stepping Westward, the second of Richards's autobiographies (the first, When I Was Your Age, was for children and was published by Estes & Lauriat in 1893), serves as the source for most of this essay and the images accompanying it. Citations for all future quotations from Stepping Westward are parenthetical in the text. Ruth Hill Viguers, "Laura E. Richards, Joyous Companion," pt. 1, Horn Book Magazine (April, 1956), 94. Quoted material within the passage is attributed to Maud Howe Elliott's Three Generations (Little, Brown & Company, 1923). [4a] Viguers, pt. 3 (October, 1956), 383. [4b] Laura E. Richards, letter to Elizabeth Thorndike Thronton. Quoted in Viguers, pt. 2 (June, 1956), 170. The Dial (16 December 1897), 401. Quoted in "Laura E. Richards," Children's Literature Review, vol. 54, 166. Cornelia Meigs, Anne Thaxter Eaton, Elizabeth Nesbitt, and Ruth Hill Viguers, A Critical History of Children's Literature, rev. ed. (New York: Macmillan Publishing Co., Inc., 1969) , 351.
 Review of Tirra Lirra. NYT Book Review (23 October 1932), 13. Quoted in CLR, 169. Viguers credits her with founding this club (pt. 2, 173).